Just up in Club Nintendo's rewards catalog is a three-poster set, one of which depicts the twelve iterations of Link, beginning with the original Legend of Zelda in 1987 continuing through the Phantom Hourglass 20 years later. 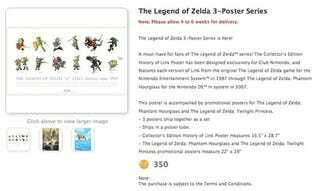 The poster is 16.5 by 28.7 inches, accompanied by two 22 by 28 inch promotion posters for Phantom Hourglass and Twilight Princess. They may be redeemed for 350 coins.